Home / AT3 Tactical AR Academy / AR15 Triggers Explained – Is it Worth Upgrading Your Trigger? 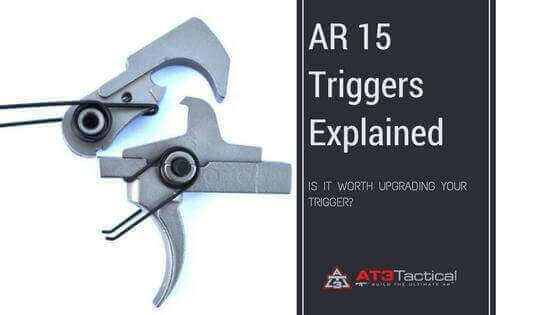 AR15 Triggers Explained – Is it Worth Upgrading Your Trigger? Your AR15 trigger needs to be 100% reliable and consistent if you want to shoot accurately. In fact, if you’re trying to improve the accuracy of your rifle, a trigger upgrade is the best place to start. The best triggers will “break” without any warning – this increases accuracy because you cannot flinch to anticipate the recoil of the shot. Also, if you are not thinking about the trigger break, it means you have greater focus on the task at hand and makes you a better operator. A good trigger doesn’t have to be pulled back a long way before it “breaks” and fires a shot. This very short travel prevents application of excessive force which can lead to inaccurate shots fired. The short travel also means that resetting for a next shot is quicker so you can put more accurate rounds downrange. Dual-stage triggers have 2 different stages when pulling the trigger – usually the first stage has a stronger trigger pull, followed by an intermediate area of travel with slight resistance (stage 2), followed by trigger break. Basically the trigger has a section of gentle resistance before it “breaks”. The desired trigger pull weight truly depends on the application. For competitive shooting, you may want to go with a “match grade” trigger that has very light trigger pull, but for uses like close-quarters combat it’s better to go with an all-around trigger with a little more pull weight. Why is this? Because a lighter trigger is easier to accidentally fire, especially in stressful situations or while moving. Lighter trigger pull can result in more accuracy (you don’t have to try as hard to pull the trigger), but it can also result in accidental discharges if you aren’t careful. Light triggers are often referred to as “match triggers” because they are typically used for competitive shooting matches, or long distance shooting. Most triggers have a curved area that fits your finger, but on some triggers it’s flat. This is personal preference – some people swear by flat triggers, some like curved. It’s up to you. While changing to a new trigger is beneficial, not all triggers are made the same and the kits they come in can be simple or complicated. When you get a trigger upgrade, try to find a “drop-in” kit – they can be installed in minutes. You don’t want a kit with loose parts working with the tiny trigger springs will drive you nuts. The type of receiver will dictate the trigger type. The VAST majority AR-15 receivers are “small pin” receivers (this is mil-spec), but some older Colt AR’s are “large pin” receivers. This refers to the size of the FRONT takedown pin hole. Below are our trigger recommendations based on trigger type. You can’t go wrong with any of these products, it just depends what you’re looking for! We recommend Geissele SSA for all-around use on an AR, as well as combat applications. It is a 2-stage trigger with a 4.5# pull weight, which means that it is light enough to shoot accurately, but heavy enough to prevent accidental discharge. This trigger is the semi-automatic civilian version of the legendary Geissele SSF trigger that is used extensively in the U.S. Special Operations community. Geissele makes some of the best triggers on the market – their manufacturing and quality control is second to none. The AT3 Enhanced Nickel Teflon AR-15 Trigger Assembly is one of the best bargain you will find (about 1/4 the price of a Geissele SSA). The Enhanced Nickel Teflon trigger assembly features smooth, precision-machined engagement surfaces and Nickel Teflon coating that removes the grittiness found in mil-spec triggers and provides a cleaner “break”. The trigger is made in the USA and has a lifetime warranty. One other thing to note – you can also get this trigger as part of a lower receiver parts kit – perfect for a new AR-15 build. Another Geissele makes the list! (we told you these were great triggers!). The Geissele SSA-E is essentially a modified version of the SSA trigger, with reduced trigger pull. This makes it an excellent match trigger – easy pull and quick reset. This trigger is also commonly used in sniper applications where accuracy and reliability are an absolute must. AR 15 Muzzle Brake vs. Flash Hider vs. Compensator – What is the Best Muzzle Device? is just as good as the tac-con but cheaper, do they work about the same?? Kenny – the Timney is a great trigger – some the Tact-con is has more settings you can change but the Timney is one of the best trigger brands out there, and it’s definitely a better price! The flat CMG trigger is hands down the most efficient and controllable trigger for the money. The flat face provides more leverage than the curved face, which actually makes the pull weight feel a bit lighter than the curved face trigger which uses the same internal parts.I have a couple of each and this is the only trigger that I will use on my builds now. Clean, crisp break, with no pre travel. I use the three and a half pound pull weight and have yet to get a premature or accidental discharge out of a CMG trigger, over a year and a half after purchasing my first. Superb product at an excellent value. CMG functionality dominates triggers doubling it’s price. Has anyone considered the hiperfire 24c. Installed on my m400, she feels like a different rifle. Best trigger I’ve tried. I became a believer in drop-ins. The best one I bought was a Timney 2-stage. I put it in my DPMS Oracle LR308. First off, it beat the factory trigger…about 8 pounds of gritty pull. Second was, it is about 2 pounds to stage and 2 more after the wall was hit… making it more accurate for me. Not a lot of “guess work” knowing when the round would be sent downrange. I know some like the single so I guess it is all preference. Just a word of advice… (because I made the mistake) … Amongst the 4 AR platforms I have is a Colt. make sure you get the correct pin size LOL. Stag, Delton and the DPMS have the same size…my Colt… Red Haired Step Child. Be safe.